This is the first joint event by JISC TechDis (an accessibility and inclusivity advisory service) and the Association of Learning Technologists aimed at challenging the perceptions of accessibility and inclusivity in Further and Higher Education. The event programme included talks from Google, Yahoo, recent JISC projects and case studies from FE/HE institutions, demonstrating approaches to inclusivity (for students with learning difficulties, disadvantaged students, students from different cultural backgrounds, students with different skills) and accessibility (for students with visual, auditory, motor impairments, learning difficulties, situational difficulties). Developing content (the content being taught) to be independent from the method of delivery (the software or hardware used to present it). For example, content could exist in a standardised format, but be delivered via text-to-speech conversion, web page or mobile phone. Provide the learner with the tools and options to facilitate access to the content in a way to suit their preferences. Consider a content-heavy webpage formed of multiple boxes each with distinct content areas. Whilst the aim of the page may be to cater for all tastes, for someone using a screen reader, it would be difficult and unnecessary to convey all the information on the page at once. Instead of delivering the whole page with its multiple purposes, allowing the user to control what is delivered and in what order saves time and reduces the ‘noise’ resulting from unwanted content. Often in emerging fields, the term ‘best practice’ can just reflect ‘practice’. It was encouraged that the case studies presented during the day were not seen as exemplars or ‘best practice’ models, but as one of many ways to overcome a particular access or inclusivity problem. Without critical evaluation, learning technologists can fall into the trap of seeing the first practice as the best practice. It was also noted that institutions can fall foul of being too cautious when balancing innovative technology enhanced learning (TEL) against a risk of failure in teaching projects and may not try (and hence cannot learn from) alternative practices . Elements of the conference reiterated the driving message for sound technology enhanced learning: that the technology should be used in a meaningful (value-giving and pedagogically-based) way. One of the main points was the obvious, though sometimes overlooked, consideration that for some users and some scenarios technology is not always the most appropriate aid to learning. Technology can be inclusive, but it may also be exclusive. Jane wanted to remove the sense of a ‘magic wand’ solving inclusion/accessibility problems and to change (rewire) the approaches we take towards design. Digital inclusion is seen as involving meaningful use of technologies, and this may be for some students not using technology to achieve their aims. Inclusive practice is not defined by strategies, tools or techniques but the way in which these things are used, how, by whom and for why. There is also a balancing act between the enterprising/innovative nature of TEL and the risk of failure (or perceived failure). In order for these activities to take place, and to be evaluated on whether they have benefited learners there are three ‘pleas’ to make: empower learners, organisational slack, positive risk taking. To summarise: the day would be about challenging our assumptions of accessibility/inclusivity and seeking to work with all stakeholders (primarily students) in both successful and perceived unsuccessful TEL ventures. 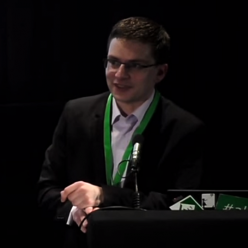 Artur briefly outlined the constraints and approaches of accessible development at Yahoo. There are currently three key hubs of activity with specialist accessibility labs: US, India, Europe. A lot of work is based on UK DDA law. Along the lines of inclusivity, he discussed ‘situation disability’. This is best described as how a car driver cannot take their hands off the wheel or be distracted, so other means of communication and interaction are required. Another example is those using the internet with different skill sets, e.g. due to age, education or background. Perceivable: That you can do x, y, z or get the information required. Interoperable: That any user interface can be used. Understandable: That the information is clear. Robust: That the information can be interpreted reliably by a number of user-agents. Accessibility works two-way. Early accessibility developments (such as text-to-speech readers and voice recognition) have now been used in a variety of modern devices, such as mobile phones. Donal is particularly fond of the iPhone which has accessibility built in, rather than requiring a proprietary third-party, and often expensive, add-on. This is a marked change as a result of more awareness about accessibility, that developments should be accessible by standard rather than requiring further expense. Using an iPod with MP3s. Each MP3 relates to a slide/section of the lecture. E.g. on one page you may have: text, video, tasks, questions, a particular order of information. In light of this: keep the stream of information simple and give control to the user on how the flow of information is delivered. Consider user needs versus product design. The user requirements profiles often don’t include accessibility, these may be fed in by a ‘user experience group’ which then influences the interface design by working on specific user tasks and seeing how well these can be achieved. There is a balance that needs to be met between user interface, media and accessibility. Adopt a ‘design-for-all’ approach so that accessibility isn’t a bolt-on, but inclusive from the outset. There will possibly be cultural changes from this. Note though that ‘design-for-all’ is not ‘one-size-fits-all’ but designing flexibly to allow multiple ways to access the same information. Previous Previous post: Trust or privacy? Next Next post: eLearning Tools: Blogs, wikis and discussion boards – what do you use for what?